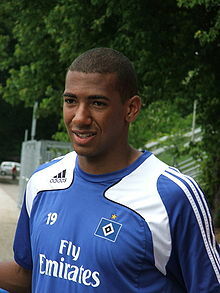 Boateng wi Hamburg in 2009. Jérôme Agyenim Boateng (German pronunciation: [ʒeˈʁoːm bo.aˈtɛŋ]) (born 3 September 1988) is a German fitbawer who currently plays for Bayern Munich an for the German naitional team. Boateng wis pairt o the Germany team that won the 2014 FIFA Warld Cup in Brazil, whaur he made mony important tackles, an pairt o the Germany team that went oot at the group stage o the 2018 toornament in Roushie; he wis sent aff in the seicont group gemme against Swaden. At UEFA Euro 2016, he scored his first goal for Germany, in a 3-0 seicont-roond win ower Slovakie. He is the brither o Kevin-Prince Boateng, wha optit tae play for the Ghanaian fitbaw team. ↑ Edwards, John (22 April 2010). "Jerome Boateng bound for Manchester City despite brother's nightmare at Spurs". The Daily Mail. UK. Retrieved 21 July 2010. ↑ "Premier League Player Profile". Premier League. Retrieved 19 April 2011. This page wis last eeditit on 6 September 2018, at 12:57.